Cradle to Cradle research papers discuss the concepts that help save the environment. This is a book report on Cradle to Cradle. It will examine whether the concepts in this reading can help save the environment. 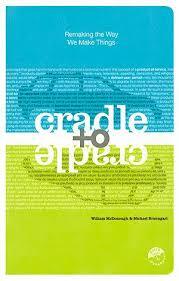 A short book report from the book called Cradle to Cradle. I want you to look at the introduction which entitled "this book is not a tree" explaining that phrase and did the authors mean it literally? Who are the authors? Briefly discuss their background and profession, why did they decide to collaborate on this book? What are their environmental concerns, design agendas and ultimate goal? Although the book is called Cradle to Cradle, the subtitle of “Remaking the Way We Make Things” is truly the descriptive working title. The opening introduction to the book entitled This Book is not a Tree explains the example of the book itself. Cradle to Cradle is not printed on traditional paper. Rather, it is constructed of a synthetic paper made of plastic resins and inorganic fillers. The purpose of constructing the book this way is to give an example of the authors’ intent to change the way society thinks about recycling. Rather than developing materials that are used once, then recycled into something else that can’t be recycled again, manufacturers should develop consumer goods that are intended to be recycled over and over. The book is durable, waterproof, and environmentally efficient. Traditional recycling takes up as many resources, chemicals, and energy as new production, and is hardly efficient. So this book, literally, is not a tree nor made from any natural fibers, and not made in the traditional manner. The authors, William McDonough and Michael Braungart, come from very different backgrounds. McDonough is trained as an architect. He learned early on that building design must be conducive to the local environment. He noted throughout his career he saw cultures that adapt to their environments, making the most efficient use of available resources. Creating his own design firm in 1984, he adopted this approach to his building designs, attempting to build as “green” as possible, creating environments that worked with efficient resources. Braungart is a German chemist, and early in his career became involved with environmentalism in Germany’s Green Party and Greenpeace. His focus was educating industry and fellow environmentalists about the dangers of chemical use in manufacturing processes. Braungart also was a founder and director of the Environmental Protection Encouragement Agency (EPEA), an organization with the purpose of building awareness of the environmental dangers of chemicals used in manufacturing. The authors met in New York City in 1991. There, they discovered a common bond in their ideas about how the world could be transformed into a more efficient society that evolved from the use of natural fibers that cannot be recycled efficiently to one that uses resources that are easily reformed from one consumer good into another, creating truly recyclable materials. Their shared vision is not one of industry versus environment, but rather a partnership that would spark a new industrial revolution. They co-authored The Hanover Principles in 1992 to provide design guidelines for the 2000 World Fair. In that book, they first introduced the concept of eliminating waste. Rather than mitigating waste, reducing it, or even avoiding it, they wanted to do away with the entire idea of waste. Everything was to be used or reused in a different form. Three years after publishing the book, McDonough and Braungart co-founded McDonough Braungart Design Chemistry. This partnership focused their efforts to turn work on chemical research, urban design, architecture, and industrial product and design into changing modern industry into a more efficient and environmentally friendly practice. In writing Cradle to Cradle, the authors introduce a concept of creating a world that does not “lament” the byproducts of an industrial world, but rather a world to “delight” in that creates an abundance of usable and reusable products. Their vision is to follow the example of nature itself. Modeling their concepts after ants, they note that organized societies are capable of living in harmony with the environment, where byproducts of manufacture benefit the earth itself. This is the process change they envision. Where byproducts are usable products that create a cycle of use and reuse, with out end. Cradle to Cradle, is not only a book written to extol that change in industry, but also a physical example of that vision and process. Notably, this concept can work, but it must be done in partnership; every person must participate in the cycle. Earth in the Balance - Earth in the Balance research papers analyze Al Gore's environmental book on the current environmental crisis across the globe. Characteristics Supply Chains - There are three Characteristics of Supply Chains that are important for organizations to possess. Properties Engineering Materials - Properties of Engineering Materials research discusses how products from these materials are manufactured, what raw resources are used, and the embodied energy and pollution in the final product. Environmental Racism - Environmental Racism research papers examine the negative conditions that impact environments where people are marginalized or disenfranchised as a result of racial discrimination. Solar Power Research Papers discuss the reasons why solar power is a more efficient and environmental friendly source of energy over fossil fuels. Abandoning Fossil Fuels - Abandoning Fossil Fuels Research Papers analyze the difference between fossil fuel and hydrogen. Al Gore Environment - Al Gore and the Environment Research Papers explicate his environmental policy and Gore's book Earth in the Balance. Business Ethics Reform - In Business Ethics and Reform, companies such as AIG, Enron and WorldCom are in need of ethical reform in business. Fission Hypothesis - Fission Hypothesis Research Papers explore the way George Darwin thought the moon originated. Climate Change - Climate Change research papers examine the records and geological evidence of change in weather patterns. Environmental Microbiology - Environmental Microbiology research papers examine the scientific study of the relationship between microorganisms and their environment. Ecology Environment - Ecology and Environment research papers examine the relationship of ecology and the environment scientifically. Sustainability research papers discuss the ecological concept that describes the ability of a biological system to remain both diverse and productive. Sustainability Culture - Sustainability and Culture Research Papers on how many of today’s manufacturing and consumer practices contribute to environmental destruction. Paper Masters writes custom research papers on Cradle to Cradle and discuss the concepts that help save the environment.